Signs Your Home Needs Repiping | AllTech Services, Inc.
What Causes Uneven Heating in My Home? Will a Dirty Air Filter Really Hurt my Furnace? Your plumbing system is expansive, making its way through your home to your bathrooms, kitchen, garage, and more. Most of the pipes snaking through your property are hidden from view. Of course, this means that when you have a plumbing problem, it can be hard to detect. If you suspect you have a plumbing issue, you can call on a professional Waterford, VA plumber, such as one of the members of our team. But to know that you have a problem, you first need to know what to look and listen for. There are a number of signs that indicate you may need pipe repair, or even repiping. Sometimes just a partial repiping is needed, but in other cases—and especially in older homes—a whole-house repiping may be recommended. Keep reading to learn more. How Old Are Your Pipes? Up until the 1960s, plumbers were regularly using galvanized steel to install pipes. This is a long-lasting material, however, long-lasting means about 40-50 years. Therefore, if your home is still using it you’re almost 20 years overdue for pipe replacement. Today’s plumbing pipes are constructed of either copper or plastic piping, both of which are longer lasting and don’t experience the problems that older, galvanized steel pipes do. These problems can include the formation of rust, corrosion, and absorbing contaminants, such as lead. So the integrity of your pipes would be at risk and your health would be at risk as well. A couple leaks here or there may simply mean that you need a small repair or two, or that you should repipe at least in one area of your home. However, if you’ve had to repair numerous leaks throughout the years, in different areas of your home, it could very well mean that your plumbing system if failing. At the end of the day, repiping will be a better option than replacing corroded pipes piece by piece, both for your convenience and for your wallet. Minerals can build up in your pipes over time if you have hard water. Hard water is water that has a high level of calcium and magnesium within it. This is harmless to people and pets, so you don’t need to panic if you do have hard water. But hard water can, and does in many cases, cause problems for your plumbing appliances in the form of corrosion. Indicators such as white or yellow-green buildup around fixtures such as faucets and showerheads, water spots on your dishes out of the dishwasher, and faded clothing after washing all are signs that you do have hard water. Fortunately, this can be solved with a whole-house water softener installation. 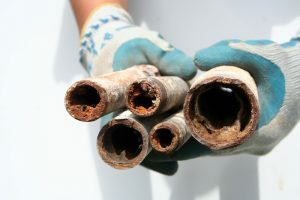 Unfortunately, if you’ve been suffering from hard water for many years, chances are your pipes are already to the point that they need replacing. Whole-house repiping is truly a “last-resort” plumbing repair. However, if you suspect you need it, we encourage you to give our pros a call. It might be something that just needs a repair, or it could be something that’ll be resolved with the right water treatment system. However, you’ll never know until you have the issue checked out by a pro! AllTech Services, Inc. is a value based business, and that shows in everything we do. Contact us today for exceptional plumbing services and more!